A 5-star mini cruiser Adriatic Pearl is a luxury motor cruiser available for rent since 2012, offering splendid sailing vacations in Croatia. Adriatic Pearl has 18 cabins overall, featuring either a kind-sized bed or twin beds with an additional lower bed, accommodating up to 36 passengers aboard. Located either on the main or on lower decks, all cabins are air-conditioned and have en suite facilities. The main salon is fully air-conditioned and consists of an elegant dining area for 40 persons, a bar and a cozy seating area decorated in plush black leather. Adriatic Pearl boasts vast outdoor spaces, two spacious sun decks with tables and sun beds, where passengers can relax and enjoy the sun, two outside toilets with showers and Wi-Fi available on the upper deck and all open parts of the yacht. With a full range of water sports equipment such as fishhooks, inflatable boats, swim fins and goggles, guests are ensured an entertaining time aboard. Available for cabin charter, Adriatic Pearl offers a comprehensive excursion package that includes a trip to Split and Omis, a visit to a stone masonry school on Brac, Hvar lavender presentation, Dubrovnik sightseeing and a visit to the island of Korcula. 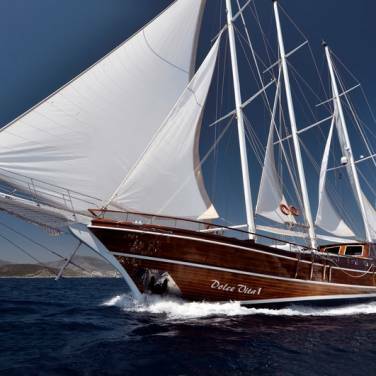 Apart from offering nontraditional sailing itineraries, Adriatic Pearl comes with 8 highly professional crew members who will render your vacation truly unforgettable. With a delicious cuisine, beautifully appointed décor and the hospitality of its crew, mini cruiser Adriatic Pearl effortlessly incorporates the most indulgent cruising experiences into a sailing holiday of a lifetime. Accommodation in 18 ensuite, air-conditioned cabins on the main and lower deck. After breakfast a local guide will take you for a walk around the town of Korčula. You will hear of its long history, ingenious building strategies, peculiar building layout and a legend of a great merchant traveler Marco Polo that was born and spent his childhood in the streets of Korčula. After the guided tour we will set sail towards the Island of Brač, passing through the scenic Pelješac channel, around the tip of Pelješac peninsula and the southeastern tip of the Island of Hvar. Weather permitting, Captain will drop the anchor on the way for a refreshing swim in a secluded bay, after which you will continue your journey towards Pucišća. Pučišća is nested in a beautiful bay on the island of Brač, surrounded by stone quarries that yield some of the whitest and best quality limestone in the world. Suffice to say that pillars of this snow-white stone decorate the façade of the White House and other landmarks all over the world. After docking at Pučišća, you can join a short visit to a stonemasonry school nearby where you will learn of the Brač limestone, their centuries-old tradition of stonemasonry and the unconventional tools they use before we continue our journey to Omiš. Overnight in Omiš. After breakfast you can join optional short walking tour where you will hear the story of this small town built below steep mountains at the mouth of river Cetina. You will also learn of its pirates that brought the town its fame in Middle Ages. In the afternoon you will continue sailing to Split, your port of call for the day. Upon arrival you are free to enjoy the Old Town and introduce yourself with the monumental Diocletian Palace built over 1700 years ago or you can go on guided walking tour. During the centuries the Old Town has grown into the palace and around it, creating a unique urban landscape. Because of its historical and architectural importance, the whole Old Town is part of the UNESCO’s List of World Cultural Heritage. Later you can just join the locals enjoying a cup of coffee on their much beloved seaside promenade. Overnight in Split. Today we sail towards Hvar, also known as the sunniest island in Croatia, famous for its endless fields of lavender and rosemary, its beautiful coast and lovely historical towns. Your destination is the town of Hvar, a town of immense beauty that buzzes with vibrant energy in the summer sun. Upon arrival, our expert local guide will take you for a walk around the ancient streets of Hvar. After the guided walking tour of Hvar we will set sail to Korčula Island. Along the way we will stop for a swim near beautiful islands (Pakleni otoci), known by warm sea. After the swimming break the Dalmatian fried fish will be served for a snack. Arrival in Vela Lula (Korčula Island) in the late afternoon. Overnight in Vela Luka (Korčula Island). Wednesday morning after leaving stunning beauty of Vela Luka your Captain will hand-pick a bay for you where he will drop the anchor. You can hop into your swimsuit and have a swim in the crystal-blue Adriatic, surrounded by pine trees and the sound of crickets. After the swim break you will continue sailing to Pomena on the island of Mljet. Island of Mljet on its western side houses National Park Mljet, known for its immense beauty and its two turquoise salty lakes surrounded by thick forest. Upon arrival you will have plenty of free time to explore the park individually, for example, by renting bikes and cycling or jogging on the numerous paths around the lakes or in the forests. You can also rent kayaks and cut the surface of the magnificent lakes to observe the scenery from a different perspective. If you feel like just relaxing you can hop onto the small boat that will take you to a tiny island on one of the lakes, where you can discover a monastery and a church of St. Mary’s built in the 12th century and enjoy a cup of coffee with the view and the quiet. Overnight in Pomena (Island of Mljet). Early in the morning Captain and his crew will take you on the route in the direction of Slano. On the way there you will witness beautiful scenery as you pass the Elaphite islands. Swim break will be made on Jakljan island and afterwards we will visit Šipan island for few hours. After the swimming break the cakes will be served for a snack. Overnight in Slano. After breakfast you are free to take optional guided tour Taste of Dalmatia –you will visit Ston small town famous of its 5 km long city walls (the longest one in Europe) and visit local vinery where you will have opportunity to taste some finest Dalmatian wines. Later, we set sail to the Lopud island for a short swim and continue to Dubrovnik and cruise beneath Dubrovnik City Walls and then to port Gruž. Upon arrival to Dubrovnik, you will be transferred to the Old Town gate where you will be joining guided tour of Dubrovnik. Our local expert will show you around this fascinating world-known landmark, an ancient town protected by 13th century fortifications. Dubrovnik was for centuries a standalone Republic and the only power able to compete with the Venetians. After the tour you will have free time to explore Dubrovnik on your own. You can take the cable-car to the top of the hill overlooking Dubrovnik for wonderful photo opportunities, make the full circle around the walls or just enjoy a scoop of ice cream as you stroll through its narrow streets paved with ancient stones. Overnight in Dubrovnik. After your last breakfast on board disembarkation follows by 09:00 AM. Departures are guaranteed. Agency reserves the right to cancel departures with less than 10 participants and change the vessel provider in case the contracted services are not supplied according to the previously agreed standards.